The Owl Who Couldn’t Whoo, by LeeAnna Kail and illustrated by Amy Rottinger, is a cute story of an owl who is different from his fellow spotted owls in the “parliament.” Ollie can’t make the normal “Whoo” sound so the other owls make fun of him. 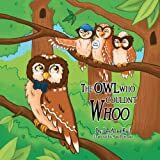 Instead of “Whoo,” Ollie says “Wheere,” “Wheen,” “Whyy,” and “Whaat.” These are silly word sounds for an owl, but later in the story they will become important. Ollie’s little sister, Pip, tries to help coach Ollie in the proper Whoo owl sound, but he can’t seem to get it. Later, Pip gets lost. Ollie’s special words help him ask the right questions to help guide his search. This story shows kids that being different may be hard, but it can also help – even save the day – in some situations. Amy Rottinger’s illustrations are playful and sweet. They help kids, especially those who are learning to read, to see the story vividly. Her animal images are clear, with emotions evident on their faces. The artwork helps move the story from page to page. Parents and teachers can use Ms. Kail’s story to help children celebrate their differences and see that being different isn’t something to be afraid of or to worry about. Our differences make us special and unique. We all can do things that others can’t. In so doing, we can appreciate our differences as gifts that make us special. Part of the World of Ink Virtual Book Tour. I love the theme of this book. A truth I try to convey to my students every year. Congratulations on your book! Right, Melissa, an important lesson for all of us to learn, but especially kids. Thanks for commenting. That's a cute idea for a book! Thanks for the great review, Penny! Hi Connie, thanks for your supportive comments and for stopping by!